Andy, Paul, and Masterpiece Tours have been an integral part of every student travel experience in my 16 years of teaching. Best of all with Masterpiece Tours, there is never any anxiety regarding the level of planning. We continue to work with Andy because not only does he seamlessly handle every detail of our trip, but he is always up for new and exciting challenges. He welcomes our ideas and looks for ways to create the best experience for our students. 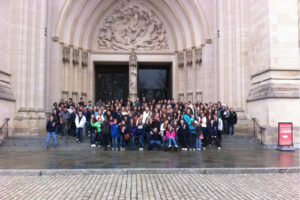 We have entrusted our high school band spring trip to Masterpiece Tours for more than ten years. Not only have they provided a level of service which exceeds our expectations each and every time, they do what they can to go the extra mile to serve the music education community locally, statewide and nationally. I can think of no tour operator/company that I can recommend more highly than Masterpiece Tours of Plano, TX. Thanks to all of you for making our recent trip to Ireland one of the best trips I have personally been on and easily the best trip the Texas A&M University Orchestra has taken. The planning was exceptional, the tours were fantastic, the food was wonderful. One of my top priorities is to ensure my students have a wonderful experience and feel they received exceptional value for the money they spent. Without exception, my students relayed to me that they indeed felt that the trip was, in their words, “totally worth it.” Because of your work, my students got exactly what I was hoping they would get; a wonderful experience abroad where they could enjoy meeting new people, share their music and develop a love and understanding of a different culture.